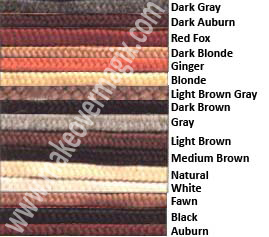 We are pleased to inform you that we have recently ordered some stocks of Crepe Wool / Crepe Hair from England. These were meant for our clients, but since we are ordering, we thought we might as well order more supplies just in case you need them. These are Curly Crepe hairs that are 100% wool products and have been braided over twine. They are sold in 12 inch lengths at SGD12 each. They are a great material for Makeup Artists who specializes in Special Effects Makeup. This item is commonly used to make chest hair, inexpensive wigs, beards, moustache, side burns and other facial hairs.